I admit that I am a bit of a latecomer to the music of Chris Daughtry. After stumbling across the video to ‘September’ about six months ago on YouTube I was inspired enough to get hold of the ‘Leave This Town’ CD, and I have never looked back. And I don’t want to get into the Reality T.V. argument here, apart from to say if the U.K. version of The X-Factor produced an artist with this much talent then I certainly wouldn’t have any issues with them. 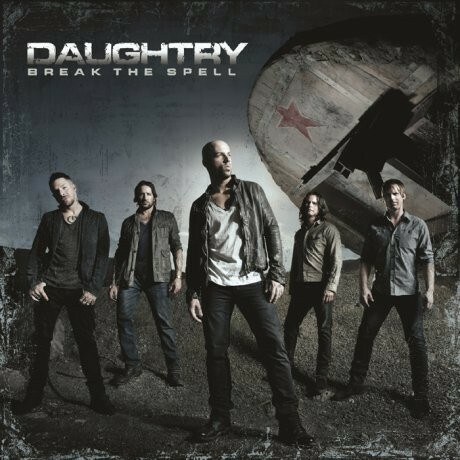 ‘Break The Spell’ continues with the Nickelback meets Matchbox Twenty contemporary U.S. style that began with the first two albums, and while it’s not quite the masterpiece that ‘Leave This Town’ was, it’s still a great album – though a word of warning, it’s not as instant, it takes a few spins to fully reveal its charms. To many people Daughtry’s music, like Nickelback’s, is regarded as formulaic, and it is hard to disagree – there’s very little in the way of complex arrangements to inspire, and the musicianship is perfectly professional without being overly-exciting. But where Daughtry’s strengths are is the melodies within the songs. Just when you think that a song is going to be nothing more than average, a huge melody comes from nowhere and completely bowls you over, and it’s that I personally find totally irresistible. Add to that the power of Chris’ Chad Kroeger meets Rob Thomas voice, and it becomes the complete package. One of the reasons I think this album isn’t quite as good as its predecessor is the lack of a true out-and-out ballad, ‘Start Of Something Good’ comes the closest. The rest of the songs flit between full out rockers and those mid-tempo anthems that Chris excels out, for instance first single ‘Crawling Back To You’, ‘We’re Not Gonna Fall’, ‘Gone Too Soon’, the quite brilliant ‘Spaceship’ and the acoustic strum-along ‘Rescue Me.’ As for the more up-tempo tunes, opener ‘Renegade’ is a full-out rocker with a chugging riff, and is the tune that hints at Nickelback the most, ‘Outta My Head’ is a bouncy pop-rocker, the title track is a brooding monster that leans more towards Matchbox Twenty, and the fantastic ‘Louder Than Ever’ is a huge throwback to the eighties – it’s a tale of driving in the summer and singing along with the radio, and it could quite easily have been recorded by the likes of Danger Danger. I’m unsure why Daughtry, along with Hinder, haven’t had more success in the U.K. or indeed been promoted like Nickelback have. I don’t think it’s a coincidence that this album was released on the same day as Kroeger & Co.’s ‘Now And Then.’ And after living with them both for the same amount of time now, as much as I love Nickelback, I think ‘Break The Spell’ is much better.